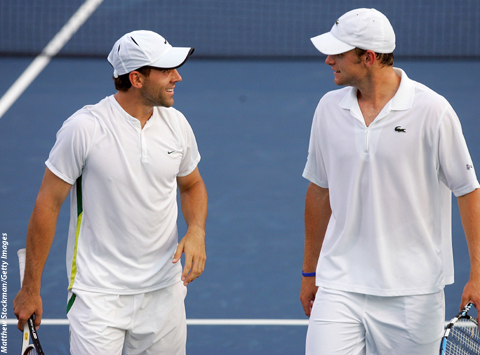 INDIANAPOLIS (AP) -- Andy Roddick made a rare doubles appearance Monday night in the RCA Championships as he tries to turn around a disappointing season. Roddick, who has fallen out of the top 10 in the ATP Tour singles rankings after failing to reach a championship final this year, teamed with Bobby Reynolds to beat Jeff Coetzee and Dominik Hrbaty 6-4, 6-4 in a first-round match. The Americans were teammates for the first time ever and didn't even practice or warm up together before the match. He'll play a second-round singles match Tuesday night against Ramon Delgado of Paraguay, a 4-6, 6-2, 7-6 (5) winner over Amer Delic. Also Monday, Thailand's Danai Udomchoke beat Tomas Cakl of the Czech Republic 6-2, 6-2 to set up a second-round match against top-seeded James Blake. Other first-round winners included Jeff Morrison and Sam Querrey, a wild- card entry who at 18 has become the youngest player from the United States ranked in the top 200. Morrison beat Mexico's Santiago Gonzalez 6-2, 6-2, and Querrey topped Serbia's Janko Tipsarevic 6-4, 6-7 (4), 6-4.